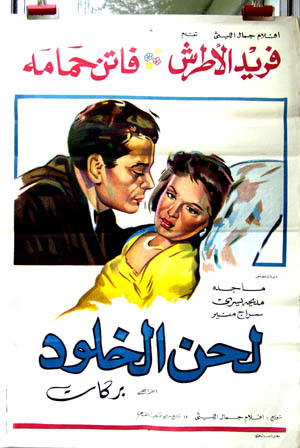 Wikipedia provides the following plot summary for this film: "Waheed (Farid Al Atrache), a famous music composer, meets Wafa (Faten Hamama), a family member and the daughter of a close friend and relative of his. Wafa has secretly had a crush on him for years and tries unsuccessfully to show her affection and hint that to Waheed. He thinks her love is nothing more than an expected family members fondness. "Wafa's father dies and Waheed offers her and her sister to move in to his house and live with him and promises to take care of them. Wafa finds herself living under the same roof with the man she loves, except that Waheed is going to marry a woman named Siham (Madiah Yousri). Time passes and Wafa tries hardly to express her love to Waheed. She treats him well and pampers him and he eventually falls in love with her. "Waheeds wife, Siham, suspects her husband of betraying her. She feels jealous and when she discovers the truth and catches her husband red-handed, she leaves him and moves to her parents house. Sihams father convinces her to leave him and get a divorce. After the divorce, Waheed marries his true love, Wafa."